Read the entire article from Ministry Magazine, October, 1993 issue HERE. 1) The church did not have an official directly voted upon trinity doctrine for the first 117 years of its existence (from 1863 to 1980). There was no corporate study ever done upon the subject by the general conference and it was only in the year 1980 that the church actually directly voted on the subject. The 1931 statement was adopted by default at the 1946 conference. Even to this day the church, at large, is in great confusion about this doctrine and it needs to be studied out officially. 2) Ellen White never used the word "trinity" to describe God in her approximately 25 million words even though she had plenty of opportunity to do so and clearly knew the word. We know that she read trinitarian authors and even used their wording at times but she never once described God as a "trinity" or spoke of a "triune God." What would you call someone who never did that? Non-trinitarian seems like a reasonable expression. The closest thing you'll ever read from her pen is the phrase the heavenly trio. Mrs. White seems to have gotten as close as you can to the trinity without crossing over. She appears to have remained neutral. She never rebuked the anti-trinitarian pioneers and wrote some things in harmony with them. She also never rebuked her post 1890 contemporaries who used trintiarian terminology and wrote some things in harmony with them. It would appear that inspiration takes a position between the two camps, supporting some aspects of each view but never embracing either holistically. 3) What is accurate to say is that from 1844 till at least 1890 the nearly unanimous position of the SDA people was non-trinitarian. This is what the fundamental principles (1872-1914) indicate. Ellen White gave strong endorsements of these principles and so there must be an aspect of truth in them that should not be abandoned. What is also accurate to say is that from 1844 up until the 1930s the consensus view remained that the pre-incarnate Son of God was begotten although there was a shift in terms of when that occurred, with some even adopting an orthodox view (i.e. eternal generation). It is between the 1950s -1970s that SDA theology started to shift toward unbegottenism which is now the dominant view. THE FOLLOWING MESSAGE WAS WRITTEN IN 1903 FOLLOWED BY THE 25 FUNDAMENTAL PRINCIPLES WHICH SHE SAID WOULD BE ACCOUNTED AS "ERROR". What did she say would happen? 1. The enemy of souls has sought to bring in the supposition that a great reformation was to take place among Seventh-day Adventists. 2. This reformation would consist in giving up the doctrines which stand as the pillars of our faith, and engaging in a process of reorganization. 3. The principles of truth that God in His wisdom has given to the remnant church, would be discarded. 4. The fundamental principles that have sustained the work for the last fifty years would be accounted as error. 5. A new organization would be established. Books of a new order would be written. 6. A system of intellectual philosophy would be introduced. 7. Nothing would be allowed to stand in the way of the new movement. The leaders would teach that virtue is better than vice, but God being removed (original concept of One God is removed and was replaced with One God means trinity), they would place their dependence on human power. 8. It's worth noting that of all the "fundamental principles" Seventh-day Adventist church has held when Ellen White wrote those words, the most notable doctrine that the modern SDA church counts it as being an error is the doctrine that the church pioneers have held that deals with the personality of God. “I must bear the messages of warning that God gives me to bear, and then leave with the Lord the results. I must now present the matter in all its bearings; for the people of God must not be despoiled. Note: When she wrote all of these warnings, Seventh-day Church was a non-trinitarian denomination and the Fundamental Principles (Fundamental Beliefs as it is called now) of the church were published annually in the church's yearbook from 1889 until the Fundamental Principles were changed and was published in 1931 and later officially voted in 1981. 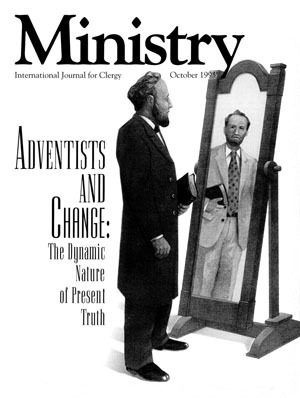 What did the Seventh-day Adventist Church believe Prior to the Change? In 1893 Ellen White said there was not a people on earth who believed in the Divinity of Christ more than Adventists. In 1888 - Ellen White was burdened that the Christian churches of America needed to know the truth about God and His Son and that those churches were in Idolatry. “This missionary seemed very liberal in his feelings toward all Christians. But after catechizing us [James and Ellen White] upon the trinity, and finding that we were not sound upon the subject of his triune God, he became earnest in denouncing unitarianism, which takes from Christ his divinity, and leaves him but a man. Here, as far as our views were concerned, he was combating a man of straw. WE DO NOT DENY THE DIVINITY OF CHRIST. WE DELIGHT IN GIVING FULL CREDIT TO ALL THOSE STRONG EXPRESSIONS OF SCRIPTURE WHICH EXALT THE SON OF GOD. We believe him to be the divine person addressed by Jehovah in the words, " Let us make man." He was with the Father before the world was. He came from God, and he says, "I go to him that sent me." The apostle speaks of Christ as he now is, our mediator, having laid aside our nature. "If any man sin, we have an advocate with the Father, Jesus Christ the righteous. “THE SIMPLE LANGUAGE OF THE SCRIPTURES REPRESENT THE FATHER AND SON AS TWO DISTINCT PERSONS. With this view of the subject there are meaning and force to language which speaks of the Father and the Son. But to say that Jesus Christ "is the very and eternal God," makes him his own son, and his own father, and that he came from himself, and went to himself. And when the Father sends Jesus Christ, whom the Heavens must receive till the times of restitution, it will simply be Jesus Christ, or the eternal Father sending himself. The attached picture is the official position from the Review and Herald in 1883. It was part of the fundamental principles (or beliefs) in 1883. The "Declaration of Fundamental Principles Taught and Practiced by Seventh-day Adventists" consisting of 25 propositions largely written by James White was published as a pamphlet at Battle Creek, Michigan. This laid down a clear non-Trinitarian foundation and is not replaced or changed in any way until 1931. These propositions are based on 1 Cor. 8:6 and contain neither the term Godhead nor Trinity. First year that the Fundamental Principles were actually published in the Yearbook was 1889. Prior to 1981, the years of publish are 1905, 1909, 1913, 1914. Then it goes dark but published again until it changed in 1931. Then 1942, 1955, 1965-66, 1973-74, 1975, 1980, 1981. 1942 - same as 1931. Not a real trinity doctrine as Jesus is the Son of the Eternal Father. He is not called or referred to as co-equal, co-eternal as in what would happen in at the Dallas GC Conference in 1980. 1955 - Same as 1931 and 1942. While the Holy Spirit was labeled as the third person of the Godhead, there isn't a first person, second person identified. And the Holy Spirit was not called God. 1981 - The unbegotten theology and the separate and individual personhood of the Holy Spirit which was finally officially adopted in all its fulness. One God is now defined as "Father, Son, and Holy Spirit, a unity of three coeternal Persons." Original 1872 Fundamental Principles; published as a pamphlet at Battle Creek, Michigan. View/Download HERE. Original 1889 SDA Yearbook (Fundamental Principles are found on pages 147 to 151). Original 1905 SDA Yearbook ( Fundamental Beliefs on p. 188-192) View/Download HERE. Original 1909 SDA Yearbook ( Fundamental Beliefs on p. 220-224) View/Download HERE. Original 1913 SDA Yearbook ( Fundamental Beliefs on p. 281-285) View/Download HERE. Original 1914 SDA Yearbook ( Fundamental Beliefs on p. 293-297) View/Download HERE. Original 1931 SDA Yearbook ( Fundamental Beliefs on p. 377-380) View/Download HERE. Original 1942 SDA Yearbook ( Fundamental Beliefs on p. 4-6) View/Download HERE. Original 1955 SDA Yearbook ( Fundamental Beliefs on p. 4-5) View/Download HERE. Original 1981 SDA Yearbook ( Fundamental Beliefs on p. 5-7) View/Download HERE. For a full archive of the SDA Yearbooks click HERE. Adventists are told that it was progressive truth that took God's remnant Church from the non-Trinitarian view to the Trinity doctrine. They say, the church pioneers grew in their understanding not unlike other beliefs or practices such as eating of the unclean meat, Sunday keeping, tobacco chewing, Sabbath's opening and closing times, or the "shut door" theory, etc. While practiced by some, the pioneers never made the above beliefs or practices into points of faith, or statements of belief. Ellen White never mentioned these matters as being true in any of her counsels nor did God give any messages to Ellen in support of these matters. As for their belief in the only true God, the Father, His only begotten literal Son Jesus Christ, and their Holy Spirit however were front and center in their statement of beliefs, were published in our prominent publications for many decades without a single rebuke and were affirmed by the living prophet. Adventists are expected to believe that God gave many important truths to His remnant Church but never told them what the correct view was on the Godhead. The truth on the Godhead is just as important as the truth on the Sabbath as you cannot have true worship with the wrong ideas about God. So often you hear Adventists say, “Ellen White was wrong about her understanding of God, and she came to the Trinitarian understanding later which also coincided with her writing The Desire of Ages. Well, there is a problem with this. Not only was Ellen White a Methodist and most of the pioneers were also Protestants (with the exception of James White who was the ordained minister of Christian Connection-a non-Trinitarian church), and the Trinity doctrine was one of the pillars of Protestantism that came from Catholicism. So how is it that none of the pioneers or Ellen White was no longer Trinitarian according to their church affiliations? The answer should be obvious! Ellen White was raised a Methodist, and Methodists still worship a Trinity to this day. So she already knew about the Trinity. Ellen White received nearly 2000 visions and her first few visions revealed the truth that the Father is indeed a Father and Jesus is begotten literally and hence is the literal Son of God just as the Bible tells us over and over again. So Ellen White could not have come out of the Trinity, accept the non-Trinitarian truth, and then go back to the Trinity again and be a true prophet. If one would only care enough to take the time to check, they would find that Ellen White wrote non-Trinitarian statements until her death. This means the quotes from her that have been abused and misunderstood are just that, abused and misunderstood. Adventists are also expected to believe that God sent Ellen White from place to place correcting others with false doctrines while allowing her own Church to believe the worst false doctrine of all. So, even though God instructed Ellen White to do this, God supposedly never told His own remnant that they were in error? Is it important to know if God and Christ are a real Father and Son or a 3 in 1 god that is just role playing? God would have corrected such an error. But He did not have to as He gave this truth as one of the pillars of faith from the beginning and why God also told her to recommend the non-Trinitarian writings of the pioneers. The change to the Trinity doctrine took place very slowly over many decades. It did not get into the fundamental beliefs for 87 years and even then most did not know it had happened, and it was not official until 136 years after the Church began. There is only one spirit that does things slowly over time so as not to be noticed. That is the spirit of Satan! But let's make this even clearer. The Lord also instructed Ellen White from the very beginning to correct others who were teaching false ideas regarding God more than once. With the above quote in mind consider the following. How could Ellen White correct others on false ideas and speculative theories about God if she was in error herself? Why would God be content for His own Church to be in error for decades and yet see the urgency to correct others? And why is there no record of her instructing a change to the Trinity doctrine? She never even used the word. There is no record of Ellen White telling anyone she had become a Trinitarian and instructing the Church to change because she never did. If she failed to inform others of such a change, then she would have failed in her duty as a messenger of the Lord. Would God instruct Ellen White to go from place to place rebuking those holding false doctrines while allowing His own remnant Church to hold the worst false doctrine of all? And how could God's prophet correct others on false ideas about Him if her own understanding was false? That is not even possible! God's remnant Church had the God given truth the entire time Ellen White was alive. It was not until after her death and that of the pioneers that error was able to be brought into the Adventist Church. So don't let anyone try and tell you that the change to the Trinity doctrine was progressive truth. Stop and think about this for a moment. If the Trinity doctrine were true, then every mainstream Church that arose after the Protestant reformation which God calls the daughters of Babylon would have been the only Churches with truth. The only mainstream Church in error would have been God's very own remnant Church, which was also the only Church that had a real live prophet to guide them. All the daughters of Babylon had the truth but God's remnant with its very own prophet was supposedly the only Church in error and God sent her to other places to correct others with false ideas and theories about God? Progressive truth they say! No, progressive error that was slowly brought in over time so as not to be noticed! The whole idea of progressive truth and God's very own remnant Church with a real live prophet to guide them being the only Church in error mocks and insults God. Adventist’s adoption of the current trinitarian doctrine is not a progressive truth but a total reversal on the most important of all doctrines. As many (actually almost all except John Harvey Kellogg as far as the prominent leadership was concerned) Adventists did not believe in the Trinity in the early years of the movement, it would only be proper for God to send Mrs White to correct their heretical views. But is this what she did? Answer: No. If she didn't do this, it begs me to ask why she didn’t! Because she certainly rebuked against any other doctrine that tried to destroy the personalities of God, namely Kellogg’s pantheism. Note: Through the visions of Ellen White, the doctrine regarding the personality of God and of Christ have been firmly established as part of our church's pillars of faith during Ellen White’s time. And yet it is clear that our church’s position has changed in this regard since then. There is no other significant changes to our church's previous doctrines other than what is now the Trinity doctrine that fits Ellen White's warning. Many do not realize that the non-Trinity doctrine is not the "new movement" which Sister White has warned us against in her writings but it is actually the other way around. It was the Trinity doctrine, which crept into our early church, many years after Ellen White's warning, that has led our church to discard its former beliefs and regard them as error. Note: Ellen White received her first vision soon after the Great Advent Disappointment in December of 1844, which was first published in 1846. Learn more HERE. The Sabbath truth was clearly given to such men as Joseph Bates and Hiram Edson in the year 1846 and was shared with Ellen and James White. Learn more about how the early Adventists came to observe the Sabbath HERE. "For a time after the disappointment in 1844, I did hold, in common with the advent body, that the door of mercy was then forever closed to the world. THIS POSITION WAS TAKEN BEFORE MY FIRST VISION WAS GIVEN ME. It was the light given me of God that corrected our error, and enabled us to see the true position." --Selected Messages, Book 1, p. 63. Did Ellen White changed and or matured in her understanding regarding the personality of God? Well, maybe we should take a closer look at what she herself had to say regarding her own faith. Notice the date—1906 (8 years after she wrote The Desire of Ages). Ellen White said in 1906 that she had not changed her faith "one jot or one tittle" for the past half century. Were Seventh-day Adventist Pioneers Arians or Semi-Arians? The Adventist history bears out that our pioneers were “non-Trinitarians”, but often, most SDA historians characterize our pioneers as either Arians or Semi Arians. Were they Arians/Semi-Arians? Or did they actually have the correct understanding of the True God of the Bible and His Son? The word Arian was used by Rome as a stigma. And that stigma would apply to anyone who disagreed with her (Roman Catholic Church and their dogma, especially the Trinity). It was like a theological slur. This had a real negative tone to it with real consequences, and history reveals that those who opposed Rome were persecuted as heretics. It is worth noting that the Seventh-day Adventist Church has adopted an attitude that is no different than the Roman Papacy as it defends its Trinity doctrine and similarly labels anyone who opposes the Trinity doctrine as either Arians or Semi-Arians. Please bear in mind that while our Pioneers held to a belief that was SIMILAR to Arians or Semi-Arians, they were NEITHER (as far as how Arians/Semi-Arians are generally viewed today). Those who characterize our pioneers as either Arians or Semi-Arians assume that they believed Christ to be a creation and this is simply a gross misrepresentation. The mischaracterization of our pioneers' beliefs (often intentional) are primarily to discredit the early SDA Church... This is the reason why "non-Trinitarian" SDAs are often viewed as Arians and are also accused of denigrating Christ as a creation. First of all, as far as trying to reconstruct what Arius actually taught, and why, it is a formidable task, both because very little of his own work survived except in quotations selected for polemical purposes by his opponents, and also because there is no certainty about what theological and philosophical traditions formed his thought based on Arius’ survived work. This does raise some legitimate questions as to why the Catholic church took such drastic measures to destroy all of Arius' work, and you are left to wonder if there is any credence to any of the criticism against Arians, for there is no way to verify what Arius actually taught. Furthermore, given the fact that the only records we have are those that either fell through the hands of the Catholic power, or those which they have chosen to keep, whether in their original form or altered by them, raises legitimate doubts as to whether or not any of the Arius’ survived work is even authentic. You can find a few remaining original documents of the early Arian controversy HERE. 2. They believe that Christ’s pre-incarnate nature was NOT of the same substance as the Father; that the Son had a nature that was inferior to the Father (semi-Arians believe Christ had a nature that was similar but not the same). 3. They believe that the Son can have no direct knowledge of the Father since the Son is finite and of a different order of existence. ἀδύνατα γὰρ αὐτῷ τὸν πατέρα τε ἐξιχνιάσει, ὅς ἐστιν ἐφ’ ἑαυτοῦ. For being the Son, his existence is most certainly at the will of the Father. is not able to conceive of or grasp the existence of that which has no beginning." 4. They believe that the Holy Spirit is merely a force, an energy or a pervading essence. What did our pioneers believe? 1. Not unlike the Arians and the Semi-Arians, our pioneers believed Christ had a point of origin, but NONE of our pioneers believed that Christ was a “creation” nor that He had an inferior nature than the Father. Rather, they believed Christ to be the literal “begotten” Son of God who possessed the same eternal nature as the Father. 2. Our pioneers believed Ellen White’s testimony that Christ had the same “nature” as the Father as a pre-incarnate Son. They did not believe that Christ had a nature that was inferior to the Father. Note: When Ellen White says “one substance”, she means “possessing the same attributes”, NOT that the Father and the Son are an amalgamation of one substance; they are two distinct personalities. 3. Our pioneers also believed as Ellen White that Christ “knows” the Father and had full access to all the counsels of God. 4. Our pioneers also believed that the Holy Spirit is the Omnipresence of the Father and the Son and not a third separate being as the Trinity claims. They also viewed the Holy Spirit as a "personal" presence of God and Christ and not merely as an energy or a pervading essence. If we notice carefully, Ellen White clearly recalls that "A line of truth extending from that time to the time when we shall enter the city of God, was made plain to me". This shows that God had given to Ellen White all the necessary pillars of truth which our church needed from the time she was writing forward until "we shall enter the city of God." Notice that the doctrine regarding the personality of God or of Christ was already been established during Ellen White’s time and she warned us not to change it. And yet it is clear that our church’s position has changed since then. The Bible clearly teaches that no other foundation can be laid than Jesus Christ (1 Cor. 3:11) If Adventism built a system of beliefs upon a view of Christ that was essentially incorrect, then the foundation is wrong and the entire system is wrong. This point cannot be sidelined or overlooked. “Question: What serious objection is there to the doctrine of the Trinity? In Matthew 16:13-17, there is a very interesting conversation between Jesus and His disciples. Jesus said, “Whom do men say that I the Son of man am?” The disciples then gave some answers like Elijah and Jeremiah. Jesus then said, “But whom say ye that I am?” Peter's answer was absolutely correct. He said, “Thou art the Christ, the Son of the living God.” Jesus confirmed Peter's answer, “Blessed art thou, Simon Barjona: for flesh and blood hath not revealed it unto thee, but my Father which is in heaven.” Peter knew that Jesus was and is the real Son of God! The belief that Jesus is the literal Son of God is the heart of the gospel. Take out the foundation and the building crumbles around it. With that thought in mind, let's look for a minute at what the Scripture teaches us about the Antichrist. The apostle John calls those who denies Christ as God’s Son, Antichrists. Ellen White confirms this also. Ellen White tells us that “the omega would follow”. She was certain of it. And she also tells us that it would be in regard to the “presence and personality of God”. The first and great doctrine of the church has to do with our God according to Jesus Christ. And this is the issue in which she said the “omega” would be regarding. Kellogg was promoting strange ideas, an impersonal God, one that could be made up of everything, or was in everything. Ellen White explained to Kellogg following these teachings that a person could eventually end up worshipping trees, stones, shoes, etc. NOTE: Here we find Ellen White admonishing Kellogg's errors which he held in regards to the personality of God. It's worth noting that the subject of the personality of God, according to Ellen White was very important. She stated, "which is everything to us as a people." Yet not a single statement of hers can be found rebuking the "errors" held by our pioneers, the non-Trinitarian views. In the quote above from Kellogg, we see clearly he is not in agreement with Butler and that Butler is not on board respecting the person of the Holy Spirit. She goes on to speak about this misuse and misunderstanding of her statements such as what Kellogg had done. Ellen White was not in agreement with Kellogg’s views. She felt that John Harvey Kellogg had taken her statements out of their context. Kellogg was saying to Butler that he felt Ellen agreed with him regarding the Holy Spirit being a person like the Father and Son, but in the letters we have between Butler and Ellen, she agrees with Butler and is out of harmony with Kellogg. To learn more on John Harvey Kellogg and the Trinity Doctrine, click HERE. Dudley Marvin Canright and his criticisms played a significant role in the introduction of the doctrine of the trinity within Seventh-day Adventism. “Dudley Marvin Canright was a prominent leader in Seventh-day Adventism and had an on again, off again relationship with the church. He left the fold for the final time in 1887 and in 1889 he published his book Seventh-day Adventism Renounced. Its import is best explained by the historian Gary Land. "His book Seventh- day Adventism Renounced became the chief weapon used by Evangelicals against Seventh-day Adventists..." (Adventism in America: a history - Page 105, Gary Land -1986). The linked article below by Jason Smith examines the theory that the 1888 meetings were the impetus that first introduced the trinity into Adventism in a positive sense. Contrary to that theory, the article suggests that it was actually a reaction to D.M. Canright. For further study, click HERE for the article, Dudley Canright and the SDA trinity. LeRoy Froom: (October 16, 1890 – February 20, 1974) was a Seventh-day Adventist minister and historian whose many writings have been recognized by the church. He was also a central figure in the meetings with evangelicals that led to the publication of the Adventist theological book, Questions on Doctrine; he authored such books as The Coming of the Comforter, 4 Volumes of Prophetic Faith of Our Fathers, Movement of Destiny, and the notable compilation of the writings of Ellen G. White, Evangelism. So how did the central doctrine of the Catholic Church end up as a doctrine of the Seventh-day Adventist faith? It may come as a surprise to many that LeRoy Froom was largely responsible for introducing the Trinity doctrine into the Adventist Church, and purposefully set about to promote its acceptance and institute it into the beliefs of the Church. LeRoy Froom set out to search over 100,000 pages of her writings (25,000,000 words) for anything that could be mistaken as being Trinitarian and managed to find a small handful of quotes that he rightly figured could. He then placed these quotes into a book called Evangelism. Most think that the quotes called “EV” or “Evangelism” are from a book written by Ellen White. But it was a compilation by Froom in 1946 which was 30 years after the death of Ellen White. While we may not know his true intent, Froom compiled various “Trinitarian” quotes from Ellen White in the book Evangelism (mostly found in pages 613 to 617) where she appears to have written Trinitarian statements such as “third person”, “three great powers”, and “Heavenly trio” etc. It so happened that the collection of these statements in the book Evangelism (mostly found in pages 613 to 617) presents only one side of the story when it comes to the personality of God. It has left out volumes of evidence in dealing with the Holy Spirit and the personality of God that would give you a full, comprehensive understanding on the subject. Unfortunately, Evangelism became the go to book in defending the Trinity doctrine of the church. Too many people go to this single book, and they stop there and the subject is already settled in their minds; they don’t see what is left out. They fail to realize that the representations of the Godhead in the book is not the whole picture but only a partial truth and therefore dishonest. But even so, most say, "the views contained in these few statements (that are found in Evangelism) are clear enough and therefore we don’t need to go any further.” They fail to include volumes of statements that would bring much clarity to many misunderstandings and false representations. This is how Froom eventually managed to lead the majority of the Adventist Church astray because people did not take the time to research what else Ellen White wrote in this regard. She in fact wrote numerous non-Trinitarian statements right through to her death, which is very easy to confirm if people would only take the time to look without prejudice. 1) Falsify the history about the original SDA pioneer position regarding the trinity. This revisionist history can be seen in the books Questions on Doctrine and Movement of Destiny. While Froom is not the originator of this tactic he is most certainly the key perpetuater and popularizer of it. 2) Burn evidence to the contrary. This little known fact reveals much about Mr. Froom. True historians do not burn the source material yet Froom did! When I learned about this I was not even surprised. It fit the pattern perfectly because based on the personal letters that he received LeRoy Froom actually knew the truth but chose to lie anyway. It's just more dishonest, underhanded tactics on Froom's part. 3) Promote unbegottenism by introducing new theology and playing a part in having the old pioneer references to the begotten Son expunged. Due to this Froom is certainly culpable for the psuedo-tritheistic doctrine that exists in Adventism today. It is also notable that LeRoy Froom did not start with the Bible and then move on to the writings of Ellen White. Instead he did the exact opposite. He actually began with the writings of Ellen White in order to try and find support for his belief. The fact is that Froom's belief in the Trinity and the Holy Spirit came from outside of the Seventh-day Adventist faith, and he set out to try and support it with statements from the Spirit of Prophecy. The reason LeRoy Froom had to go to outside sources, rather than use writings from our Pioneers is because none of the early pioneers were Trinitarians and therefore did not agree with Froom's opinions. This is also why Froom had to wait until Ellen White and the pioneers had all passed away before he could try and achieve his goal. How could this be a greater light as they called it a hundred years later? In his book “Movement of Destiny”, which was published in 1971, he tells us how he came to write about the Holy Spirit and believe in the Trinity. How much of what he wrote is truth as he understood is unknown considering other facts. He states that what he calls the “Truth of the Trinity” was an inevitable evolution in our theology stemming from the 1888 Conference and message. He concludes his brief account by claiming that the book The Desire of Ages presented an “inspired depiction” of the Trinity doctrine and because of this it has become our denominations' “accepted position.” And yet the Desire of Ages is filled with non-Trinitarian statements. LeRoy Froom boasts that the Desire of Ages was even publicized in a prominent Catholic journal. Here are his own words, “...The Desire of Ages, of course, presented an inspired depiction, and was consequently destined to become the denominationally accepted position.... The Desire of Ages.... is one of the most highly esteemed books of the Denomination--a recognized classic, even publicized in such a Catholic journal as the “Universal Fatima News” for September 1965.” (Movement of Destiny; pp. 323, 324). As a professed Seventh-day Adventist, why would he be so proud of its endorsement and publicity in a Catholic Journal? That is what you would expect from a Catholic, not an Adventist. The book Truth Triumphant written by Adventist theologian Dr. B.G. Wilkinson is an exhaustive study of the history of God's Church in the wilderness and contained statements against the Catholic Church. Froom was angry about the book and ordered the destruction of the offset press plates so the book could not be reprinted. Wilkinson was 80 years of age at this point and could not afford to have the plates made again. Why would an Adventist do such a thing unless of course he was a Catholic? Something is very wrong here and I am inclined to believe the testimony. On the 14 December 1955, LeRoy Froom in a letter to Reuben Figuhr wrote, “I was publicly denounced in the chapel at the Washington Missionary College by Dr. B. G. Wilkinson as the most dangerous man in this denomination.” This took place in the mid 1940's. I believe Dr. B.G. Wilkinson had very good reason for saying this, much to the disgruntlement of Froom. Note that the “old timers” described in Froom's letter below are our pioneers. They are the ones who knew what the Church believed while Ellen White was alive and they denied the doctrine of the Trinity Froom was pushing. So who was left to oppose Froom once Ellen white and the pioneers had passed on? The following letter from Froom reveals his agenda was to try and convince others that Ellen White was a Trinitarian for the sole purpose of getting the Church to follow his direction. Here is the letter to Roy Allen Anderson revealing its intent and purpose. The abused and misunderstood quotes from Ellen White are still being used to pervert the truth today. “I am sure that we are agreed in evaluating the book Evangelism as one of the great contributions in which the Ministerial Association had a part back in those days. You know what it did with men in the Columbia Union who came face to face with the clear, unequivocal statements of the Spirit of Prophecy on the Deity of Christ, personality of the Holy Spirit, the Trinity, and the like. They either had to lay down their arms and accept those statements, or else they had to reject the Spirit of Prophecy. Froom found “every” major statement from Ellen White that could be abused and misunderstood which means he literally had to look at everything she wrote. Could he be so deceived that he could not tell the difference between a non-Trinitarian and Trinitarian statement? Highly unlikely. He had no trouble finding every single statement that could be misunderstood so he had to know the difference. That means Froom saw the tens of thousands of non-Trinitarian statements that she wrote throughout her entire life. And he would also know that she wrote non-Trinitarian statements right through to her death. So LeRoy Froom had to know Ellen White never became a Trinitarian. How could all that he did not be intentional? 1) He looked to sources outside the Adventist Church because he couldn't find anything within our writings to fit his agenda. 2) He searched 100,000 pages (25,000,000 words) of Ellen White's writings for anything that could be misunderstood. 3) He wrote his book Evangelism after a trip to the Vatican in which he placed the misunderstood quotes he found. 4) When Adventists use these quotes they almost always have Froom's book as the source and yet he did not write them. 5) Hence most Adventist Trinitarians believe that Evangelism was written by Ellen White, further revealing the deception. 6) Froom boasted that the Desire of Ages was even publicized in a prominent Catholic journal. 7) He wrote that the Desire of Ages was an inspired depiction of the Trinity doctrine and why it is now accepted by the Church. 8) Yet the Desire of Ages is a non-Trinitarian book proven by all the non-Trinitarian statements, again revealing the deception. 9) Froom wrote a letter stating that the pioneers in their old age strongly opposed the Trinity doctrine that he was pushing. 10) Froom had the printing plates of a book destroyed that was not his that revealed many truths about the Catholic Church. 11) It is “alleged” that Froom was seen functioning as a Catholic priest prior to entering the Adventist Church. 12) Dr. B.G. Wilkinson publicly denounced Froom as being the most dangerous man in the Adventist Church. 13) Froom wrote a letter stating how he was able to change the Church by the Spirit of Prophecy quotes he searched for. Ellen White said serious error would be brought into the Adventist Church after her death, and Revelation 12:17 states that Satan would make war with God's remnant. So how far can and would Satan go? Could some Adventist pastors have the spirit of Satan while thinking they have the Holy Spirit? Most would say no. Click HERE to learn more about how LeRoy Froom systematically altered the course of Adventist history.